This page lists free apps developed and provided by SPISim. SPISim_IBIS: For converting IBIS to spice circuit to be used with free circuit simulators. SPISim_AMI: For IBIS-AMI model generation and what-if. SPISim_LINK: For Stat-Eye type link analysis supporting both statistical and bit-by-bit modes. SPISim_IBIS/AMI/LINK are web apps and can be launched directly via web browser. They all are capable of self-update and will never expire. Switch to their tabs for screenshots and further details. SPISim_IBIS: A free web app for simulating IBIS using free simulators. 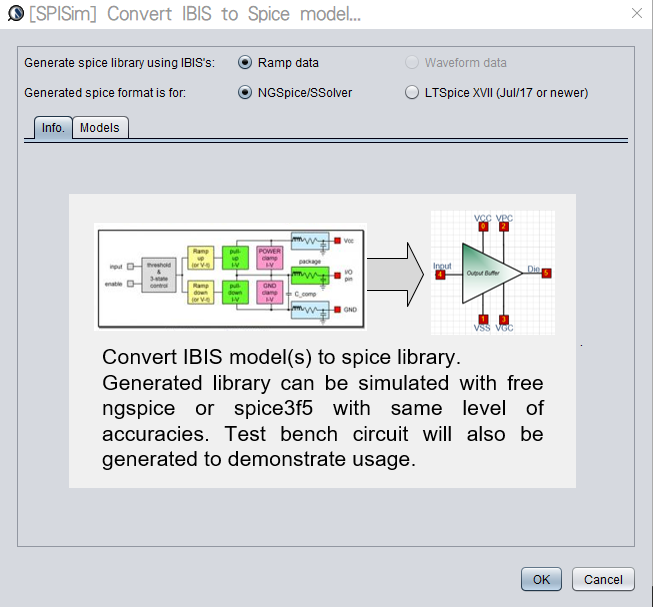 It allows user to convert an IBIS model to corresponding spice sub-circuit then simulate with free circuit simulator such as LTSpice, NGSpice or SSolver. SPISim_IBIS can be launched from web browser without installation! Visit SPISim_IBIS product page for more details. SPISim_AMI: A free web app for generating IBIS-AMI models. It allows user to configure and generate IBIS-AMI model without any coding or compilation. 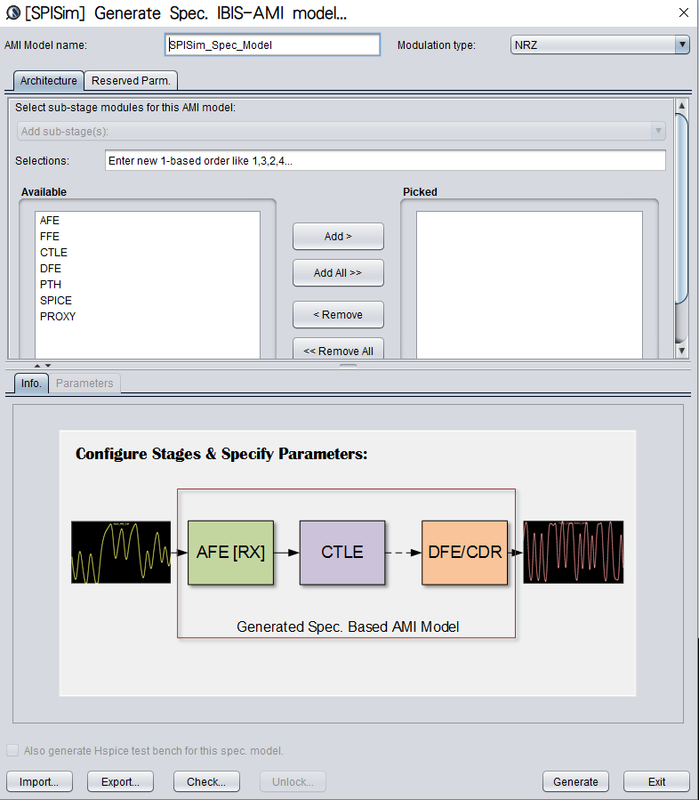 Generated model can be run on 3rd party, commercial tools such as Mentor's HyperLynx, KeySight's ADS, Synopsys's HSpice and Cadence's SystemSI etc. SPISim_AMI can be launched from web browser without installation! Visit SPISim_AMI product page for more details. SPISim_LINK: A free web app for link's StatEye analysis. 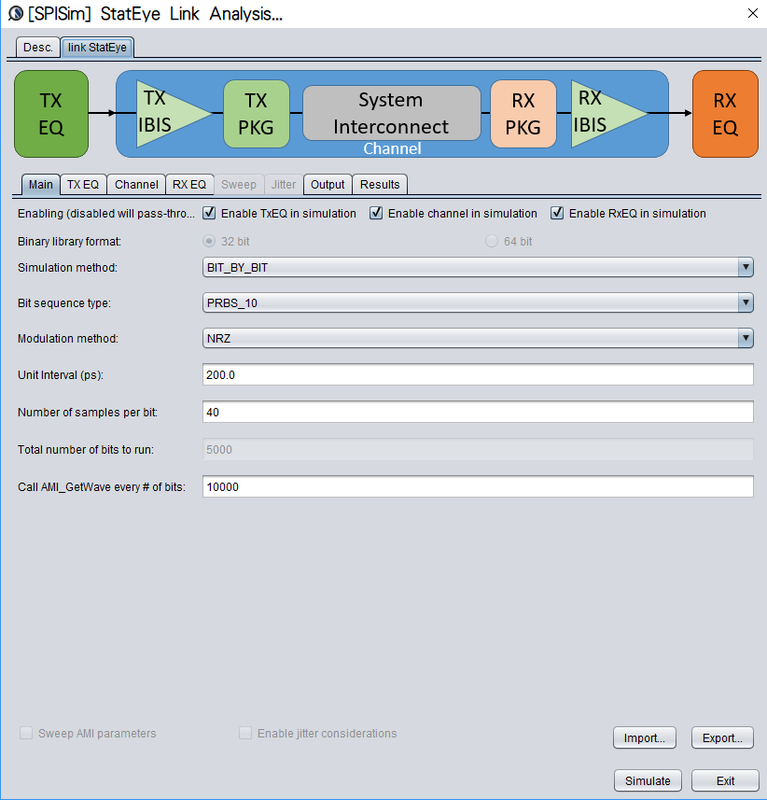 It allows user to configure channel using IBIS, interconnect, Tx/Rx AMI models and perform StatEye link analysis. Both statistical and bit-by-bit modes are supported. SPISim_LINK can be launched from web browser without installation! Visit SPISim_LINK product page for more details. SPISimLite: A free module for SI/IBIS/Snp analysis. 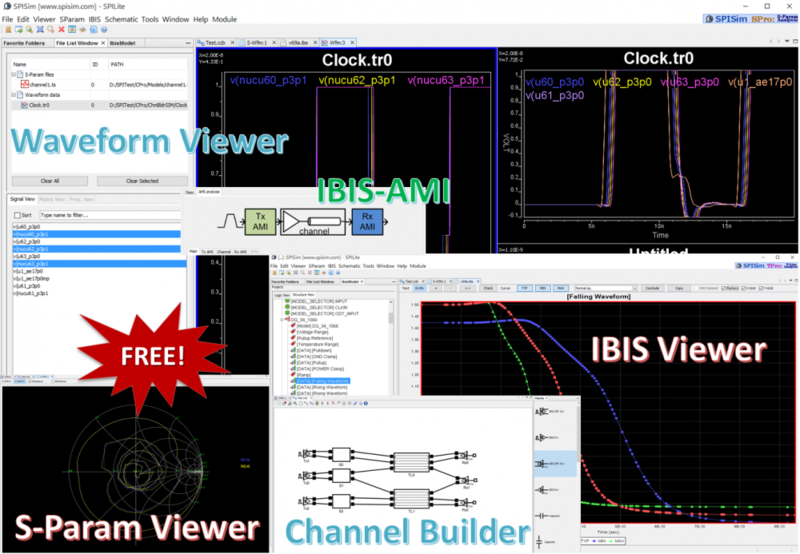 It is a cross platform, free Channel builder, tr0/ac0/raw, Snp and IBIS and AMI tool brought to you by SPISim. SPISimLite is complementary with any paid/activated SPISim module. Existing SPILite installation for non-paid customer will be disabled on Dec/31/2018. Once OpenJDK becomes more mature/stable, SPISim maybe able to offer free SPISimLite again. Visit SPISimLite product page for more details. Interested user may also see this post [A channel analysis trilogy] for design concepts of this flow.